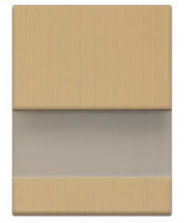 Enhance the look of your Fullwrap doors with glass inserts. The use of glass in your space reduces any visual heaviness in your single or multifamily residential project and adds interest to the design palette. Pentco does not supply the glass or installation. Typically glass installation is the responsibility of the cabinet maker. Special arrangements can be made by Pentco to supply larger volume orders with glass and installation for horizontal and vertical rails if required. Prior to machining, a sample piece of glass is required at the time of placing an order. Rails are slotted for specific glass size. When ordering your glass, ensure unslotted edges are polished. Please contact us for more details and for glass requirements. Please Note: Rails are grooved for a half inch insertion on either side of the glass. Please consider 4mm glass thickness. 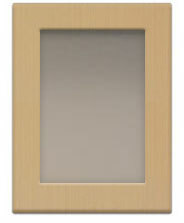 Uncover new visual possiblities with a glass panel insert. Visually enhance the width of your scene with a horizontal glass rail. 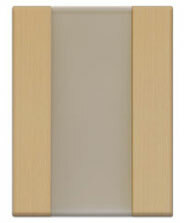 Expand your view upward by using a vertical glass rail in your door.